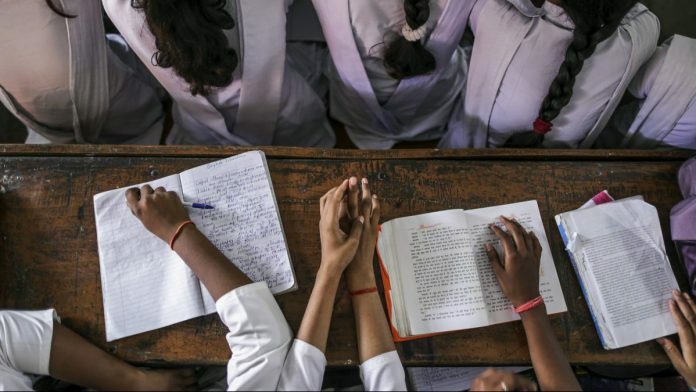 New Delhi: The Central Board of Secondary Education (CBSE) has asked affiliated schools to drop five social science chapters from the Class 10 board exam syllabus, while retaining them for internal assessment. This means that the chapters will stay in the books, will be taught, but needn’t be studied by students for the board examination. The chapters comprise three on political studies and two on the environment: The former are “Challenges to Democracy”, which seeks to encourage thought about problems facing the governance system, as well as political reforms, “Democracy and Diversity”, on the politics of social divisions, and “Political Struggles and Movements”, which dwells on popular struggles in Nepal and Bolivia, among other things. The other two are “Forest and Wildlife”, about biodiversity, vanishing forests, Asiatic Cheetah and other endangered animals, and “Water Resources”, which includes lessons on water conservation. The order, however, does not offer any explanation for the decision. Calls and texts to senior CBSE officials for comment remained unanswered. This report will be updated when they respond. Although the CBSE did not give any explanation about the exercise, school teachers ThePrint approached said it stemmed from an an earlier circular from the board about strengthening internal assessment. In the circular, issued this March and accessed by ThePrint, the board said it wanted to align its assessment patterns with “future needs” as the Union Human Resource Development Ministry had decided to participate in the Programme for International Student Assessment (PISA) in 2021. PISA is coordinated by the Organisation for Economic Cooperation and Development (OECD), a 36-member grouping of industrialised nations, and assesses how well students can apply what they learn in school to real-life situations. This, the CBSE said, requires a different pattern of evaluation. “Countrywide consultations were held with CBSE stakeholders, including teachers, students, heads of institutions and experts in the field to suggest ways to strengthen the assessment and evaluation practices of the board,” reads the circular, issued to all schools on 6 March this year. “It was agreed upon that the school-based/internal assessment needs to be strengthened by incorporating more diverse strategies,” it added.